Always a popular destination for that special occasion, Queenstown Conference venues offer branding, AV, caterers and entertainment, to event management. Whatever your needs, there's a company in Queenstown to make it happen. Conferences in Queenstown is an expanding market, as more and more people choose the area for their celebrations, corporate events and landmark occasions. With stunning locations and professional boutique services, you won't have a problem remembering Queenstown as somewhere you had the best time of your life. 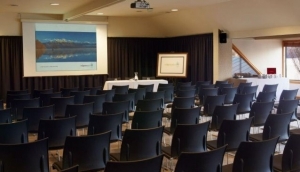 Corporate requirements can be found at most major hotels while Lake Hayes Pavilion is simple and accessible venue, and the Conference Venue at Kawarau Bridge Bungy has plenty of space, and a stage - ideal for award ceremonies or entertainment. Most bars and restaurants in Queenstown can cater for private hire cocktail parties, or why not hire an events planner to take care of every detail.